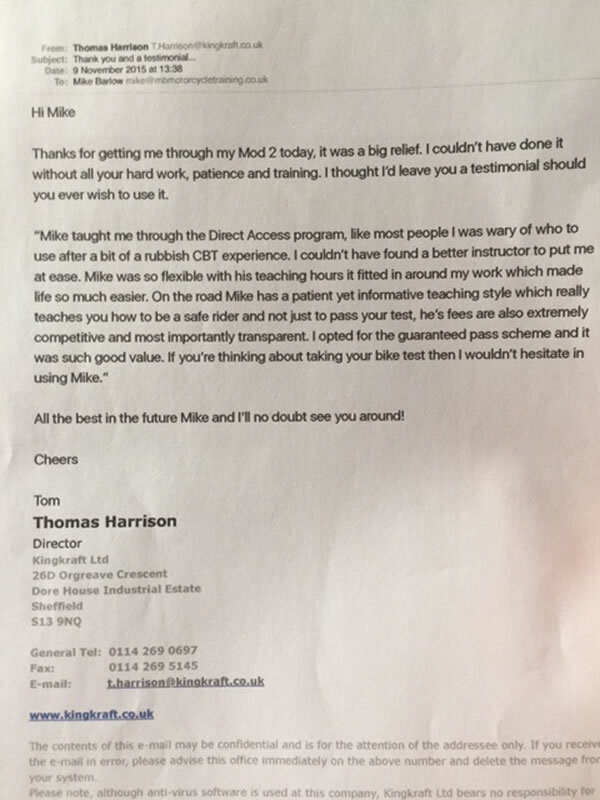 Just a quick note to say a big thank you for getting me through my DAS as quickly and efficiently as you did, thank you for your patience and the way you took time to explain things to me, which enabled me to pass first time even though I booked the full course ( just incase I didn't pass). It was a pleasure meeting you, you are not only a good teacher you are a good person. I would recommend you to anyone who would like to learn to ride. I passed first time, very quickly with Mike Barlow. I first came to Mike Barlow late 2012. I had previously done my CBT 3 years before down in Kent. I had not rode since this CBT as I had a really bad experience with the instructor. My plan was to take my full license straight after, but I was completely put off. As I have always been into motorbikes and even owned one & rode when I lived in Australia, I decided to give it another go. I moved to Derbyshire and came across a few training centers. After I spoke with Mike over the phone and told him of my bad experience I immediately felt at ease and booked my CBT straight away. After my CBT with Mike (which went really well), I felt confident to go through with my full license, finally. Mike is very understanding and has a very calming nature to him, which makes you feel at ease. 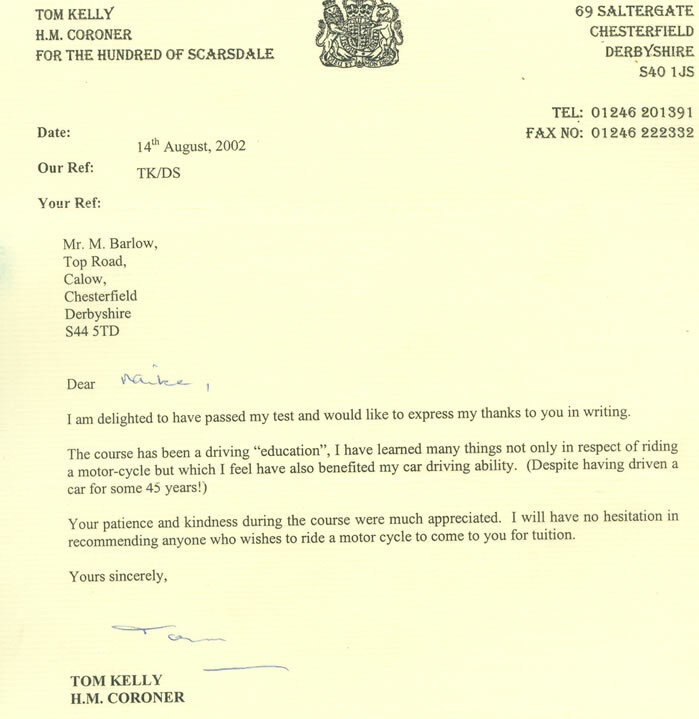 His encouragement and belief in myself was the reason I passed 1st time around with my theory, mod1 and 2. 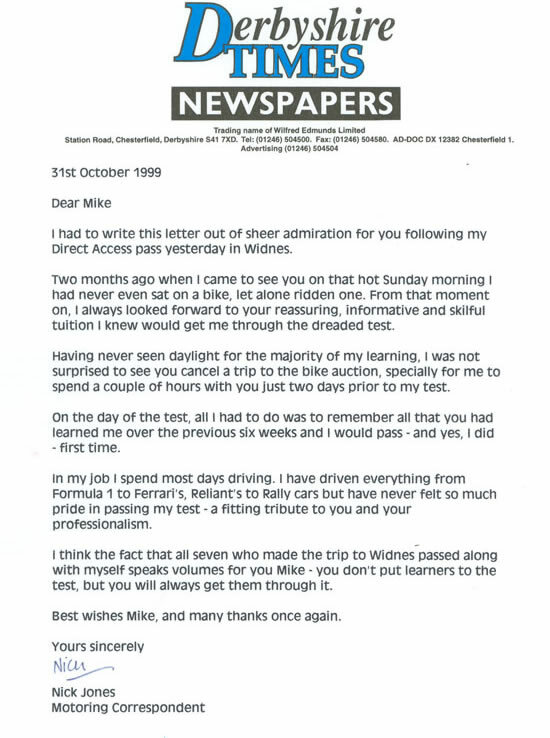 Mike was keen to get me in for my test as soon as he thought I was ready, I was surprised as I just imagined (like my car driving lessons) it would be as long and drawn out as possible, but this was not the case with Mike at all. And due to the law changes this made Mike more keen to get me booked in asap. I can honestly say it’s been a real please learning to ride with Mike and I will genuinely miss our rides out and chats over coffee. If you are serious about learning how to ride, Mike Barlow is the man. Glad to hear your keeping well and will call in for a coffee once the weather is better. After many years of wanting to get on a bike the time finally was right in September. I look around at offers and deals at many training schemes. My first experiences were not good. Everyone seemed to be to business like and training schemes seemed to have hidden costs. I always thought riding a bike was like joining a cult or elite crew. Possible I was wrong. After asking around I was recommended Mike Barlow's in Dronfield. I went to have a look and talk to see what was on offer. The attitude was totally different from Mike. I felt comfortable straight away and felt the elite group feeling. After explaining the deals and offers, instead of asking for card details/sign here etc I was asked to go away and think about it. Have a look at other offers and deals I was told. Be sure your happy. Wow what a refreshing change. It was clear that Mike is not a salesmen. They were bikers, teachers and overall nice people. For me I want to be dealing with professional trainers not professional sales people if I'm going to be jumping on a R1 in a couple of months. I want to be trained to ride it not how to sell it after I have had an accident. Needless to say I was back the very next day to pay my direct access fee. Before I knew it I was booked in for my first lesson and the scary 600cc fazer awaited. Yet again though I was surprised as I turn up for my lesson. Nervous and tense I arrived for my lesson and instead of getting on the bike I was invited for a coffee. Maybe 20 mins passed before I even started to look at the bike. Of course by this time I was much less nervous and less tense. As I now know its so difficult to ride a bike when tense, you need to be relaxed. 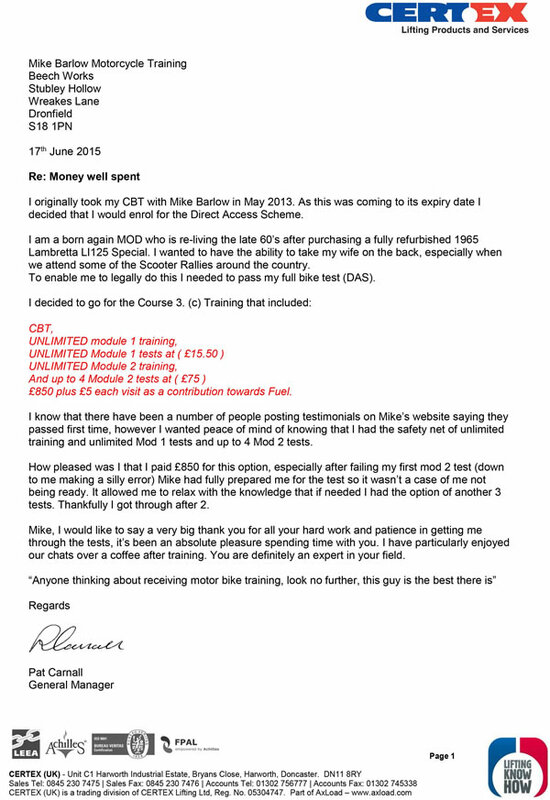 This method continued in my training and within 2 weeks I had passed my CBT, theory and I was well on the way with the mod 1. Most of the training was done on a 121 or with just one other student so the attention was great and this ment the learning was so quick. 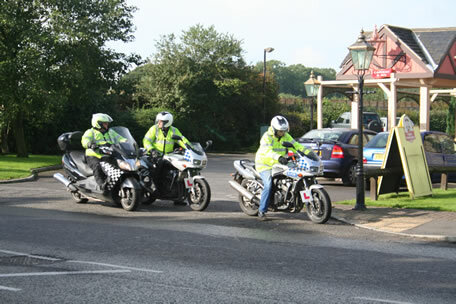 Some of the Mod 1 was done on the official test centre and this ment a mob of bikers all meeting up to go over together and learn. A great day to be part of with so many like minded people. A chance to make new friends and trade notes on our experiences, test routes and tricks of the trade. A week later I was passed my mod 1 and the mod 2 was booked in. Mike fitted me in for extra training and even got me a earlier test date as he believed I was ready. I also had the biker bug and I was itching to get my own bike. With the increased lessons and the earlier test date I was passed all the modules and had my full license by Mid October. I passed everything first time and generally feel very confident and relaxed on the roads. To sum up Mike's training school in one word would be 'understated'. From the school itself, the bikes, Mike himself, its all so understated. I don't think Mike will ever be any different to what he is now. 30+ years in the industry and all he still cares about is his students. Money, fancy equipment, massive banners all around town and fame/self gratification is not Mike. Getting you your license first time and you having years of safe fun on a bike is everything he seems to need. I have recommended Mike's training school to many people and always will. It's the least I can do for the fantastic training I received that not only made me a great bike rider but I think it helped my become a better car driver too. 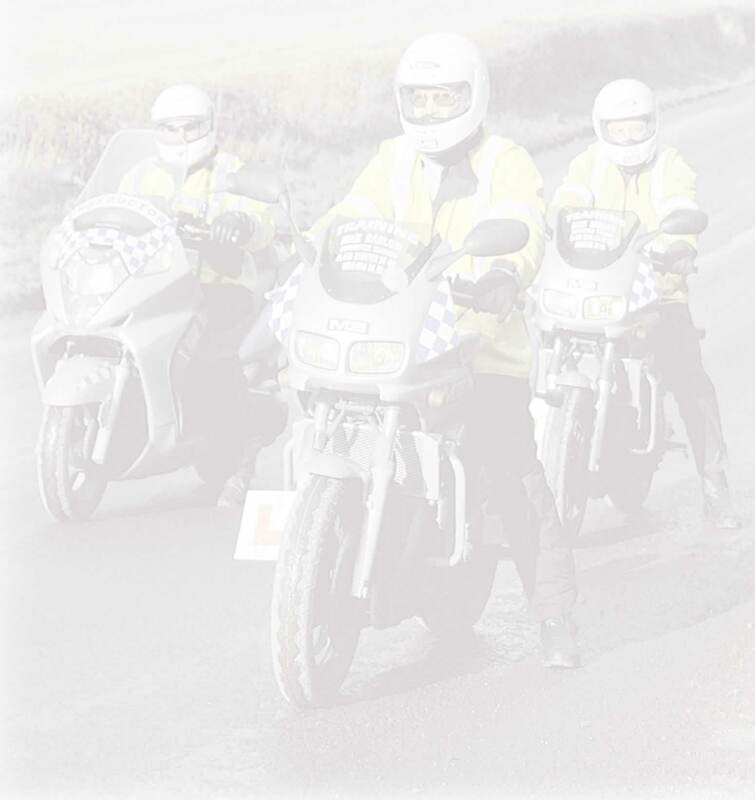 I am writing to thank you following my recent motorcycle course with you (Direct Access Scheme). I could tell straight away that you knew what you were talking about, and you explained all the options that were available to me. I decided to go for the direct access course, and was amazed at the fact that all the training was done on your Yamaha 600 cc Fazers from day one. Before finding you, I visited a few of the training organisations in Sheffield, but none of them did all of the training on the 600cc bikes. This is just one of the many things that sets you apart from the others. Your method of training and your personality automatically puts you at ease. I found your instruction clear and precise. The road rides with you were a pleasure, and you were always keen to point out safety issues like road positioning and spotting potential hazards, something which you can tend to overlook after many years of car driving. I felt like I learned something new each time we went out on the road, and I was impressed how you 'drip fed' the information so I didn't feel overwhelmed. This is obviously down to your many years experience of motorcycle instruction. Although the weather was against us, and I had test dates cancelled, you worked hard to get alternate dates for my Mod 1 test. Goes without saying that I was over the moon when I passed my Mod 1 test in Rotherham first time without any faults. Then came the Mod 2 test, which again I passed first time with just one minor mark. I was so pleased that you took the time to take me on a short ride before the test to settle the nerves. I would also like to thank Neil for his time and his wealth of motorcycle knowledge. Mike, It's not often that you get to meet someone as genuine and kind as yourself, particularly where business is involved. I felt that training with you was more like going out for a ride with a good friend. You have made the whole experience of learning to ride a pleasure. Long may your success continue. I am writing to pass on many thanks following my recent direct access course with you. From day one, I was extremely impressed with your professionalism, knowledge and kindness. 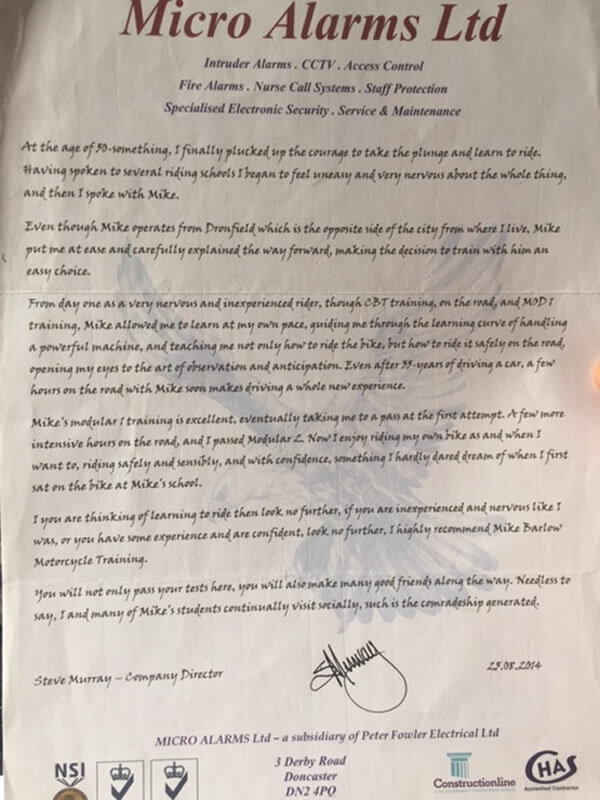 You have a unique way of making people feel at ease and at home, which is not only down to your personality, but clearly from your many years of experience as a professional motorcycle instructor. Although I have to work varied shifts, you always managed to arrange convenient times and dates for the training rides. This is undoubtedly down to your forward planning, organisation and personal sacrifice. I was particularly pleased, and surprised that the whole of my course was done on your well maintained Yamaha 600cc Fazers. The training rides with you were extremely enjoyable, each one I looked forward to immensely. You make the instruction easy to understand, and your radio equipment is crystal clear. In my role as an emergency services worker, I am required to drive to a very high standard. I found your instruction and training to that of an advanced level, with safety being your number one objective. Both myself and my friend Mark Grant who also did the course at the same time, were over the moon when we both passed our tests first time, me passing with no faults and Mark with just one minor fault, not a bad result for two people who have not had to do a driving test for 20+ years !. This was purely down to your training and preparation. I can honestly say that I would not have passed my test without your tuition. I would also like to thank you for the excellent Enhanced Rider Scheme that I did with you soon after passing my test. This has not only given me even more confidence and knowledge as a newly qualified rider, but also made a massive difference when I came to insure my new Honda 600 Hornet. We both passed our mod 1 tests with zero faults. Mike, once again thank you so much for your excellent tuition, it has been an absolute pleasure meeting you and learning to ride with you. I look forward to recommending you to as many people as possible. I hope to stay in touch and call in for a coffee and a chat on regular basis. 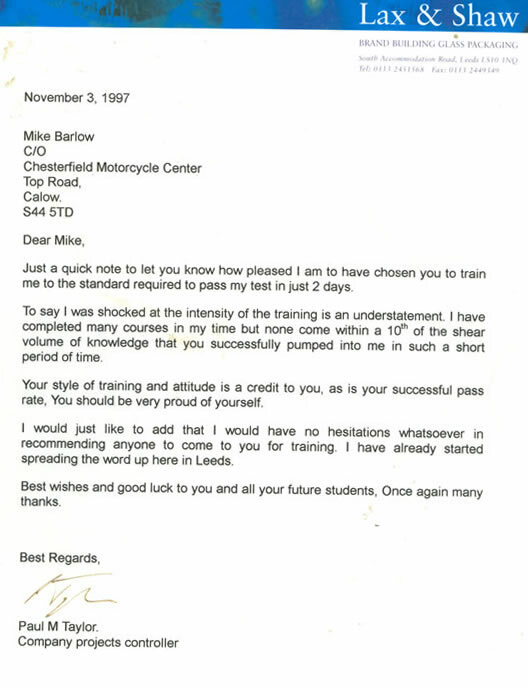 I have now studied with Mike Barlow on several different occasions not only doing my CBT (Compulsory Basic Training) with Mike but also taking my large DAS (Direct Access) bike test for my full bike license with him and on each occasion have found him to be a friendly and professional trainer with years worth of experience under his belt. I can remember first going to see Mike and how I was a young lad filled with bravado and fake confidence (like I was indestructible on the road) a young lad who thought he knew it all, but I can honestly say after just a few sessions with Mike Barlow he began to show me just how little I knew about bikes and about the roads we drive on today, within only a few sessions Mike had taught me things about riding and safety that I had never even thought about before, not only that but he dedicated some real time to MY TRAINING and he made sure my safety procedures was second to none. I remember walking away from my first training sessions with Mike feeling that me and my abilities had grown vastly, not only as a rider but more importantly as a SAFE RIDER and can honestly say that since that day Mike Barlow's dedicated training has saved my life various times on today's busy roads, as perhaps the best thing about Mike is not only his years worth of experience as a professional motorbike trainer but the simple fact that he will not rest until you have got it right. Like stated on first meeting Mike some years ago I walked in full of bravado and confidence believing in my riding abilities, I walked out however believing in Mike Barlow. I would definately recommend Mike Barlow to any trainee either young or old not only because of his friendly and caring nature, not only because of his professional outlook and years worth of experience but because Mike is a man who works hard from sunrise to sunset to deliver the best training possible, once you see that then you will realize you're in very good and safe hands, in fact with Mike as my instructor I passed my large bike test first time and the large majority of that was down to Mikes training and experience. Thanks again Mike and stay safe. After doing my CBT with another company I doubt I would have ever gone on to take lessons or my test due to the ‘scare tactics’ and criticism the other company used, I was told about Mike Barlow’s by my boyfriend as that was where he had taken his lessons and decided I would go down with him for a chat to Mike to see if I felt comfortable to take my lessons. I realised after speaking to Mike that his company definitely did not use the same ‘tactics’, in fact I was surprised with just how nice and polite they were and I realised quickly that Mike had the patience of a god, he helped me gain my confidence quickly, and not once raised his voice to me (as I’m the blonde girl out of all the dumb blonde jokes this must have been really hard!). Mike helped me with my fear of cones and the figure of 8 (for the mod 1) he told me I could pop down whenever they were open to practice it. I was very surprised to hear I had passed my mod 2 first time! And it had only taken me 4 months. 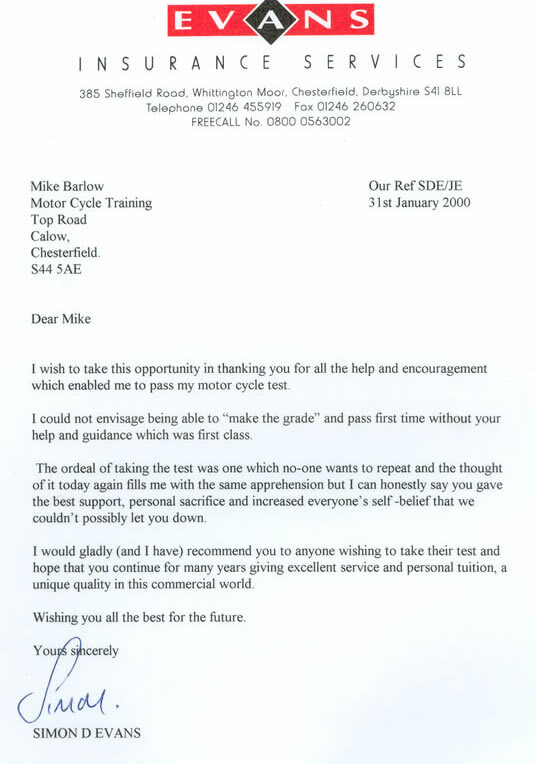 I would recommend Mike to everyone looking to ride a motorcycle…. After all, thanks to him I’m the 5ft7 brunette (natural blonde) riding around on Honda CBR 600 (…restricted). Never thought I’d see the day! a division of eBooks-UK Ltd.